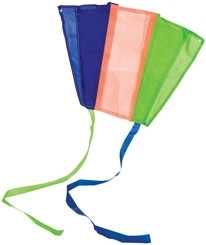 This nylon kite unfolds from the 3-1/4" zippered pocket pouch read to fly! Great for spontaneous kit flying on beach trips or hikes. Includes kite string and winder. Unfolded size is 18" x 12" with two 29" tails. For ages 5+.